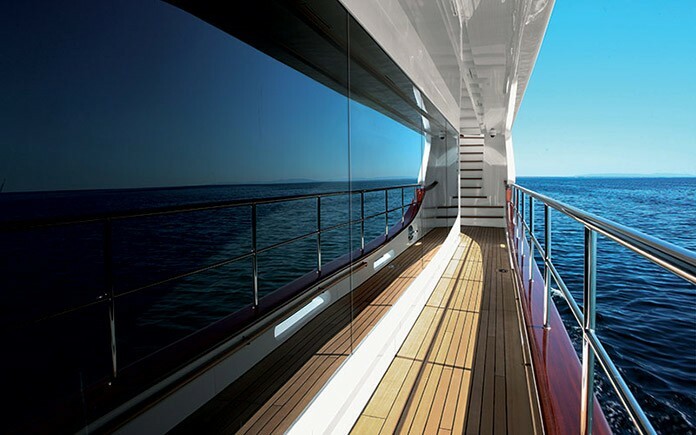 Light, transparency, and enhancement of spaces characterise the essence of the Crystal 140’, the new boat in the Benetti Class range, born from the hands of Stefano Righini for the exterior layout and François Zuretti for the interiors, with the choice of fabrics and other elements of the first-rate interior decor being the province of the interior design firm Ahmed Chabebe & Asociados. 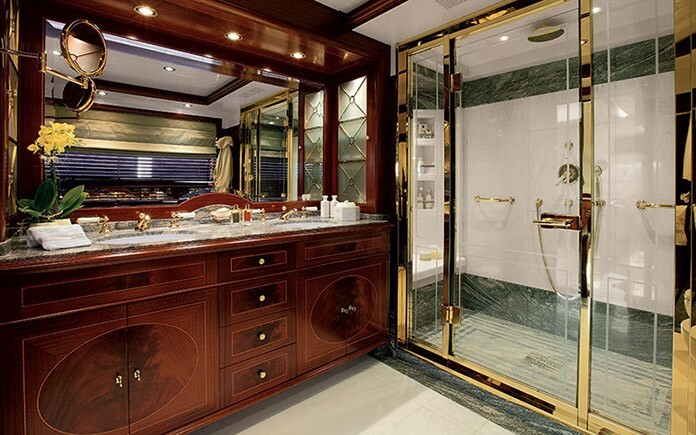 The Crystal 140’ is suited to the type of boat owner who turns toward the sea with great respect and who knows how to derive pleasure from a slow pace. Her name is Crystal. For the Greeks, this meant ice. Later it became the name for a solid mineral form synonymous with light and transparency. The modern sea requires light, needs concrete vistas of the corners of paradise that only modern “navetta” have the ability to provide. To reach enchanted places, all the security of a displacement hull with its gifts of intrinsic environmental compatibility through reduced consumption, gentle navigation that creates few waves. 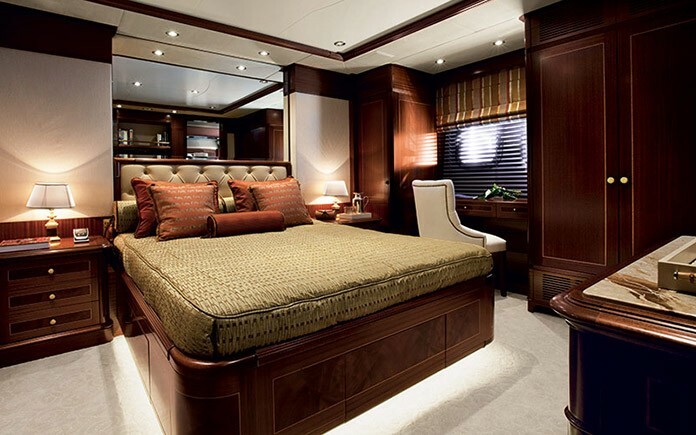 To experience the sea with large space above and below decks, with achievement of light and new functions. The interiors reveal the basic reasons for its name: a redistribution of spaces that exploits the entire volume of hull, along with special attention to light, thanks to new windows that literally eclipse the competition and the past. 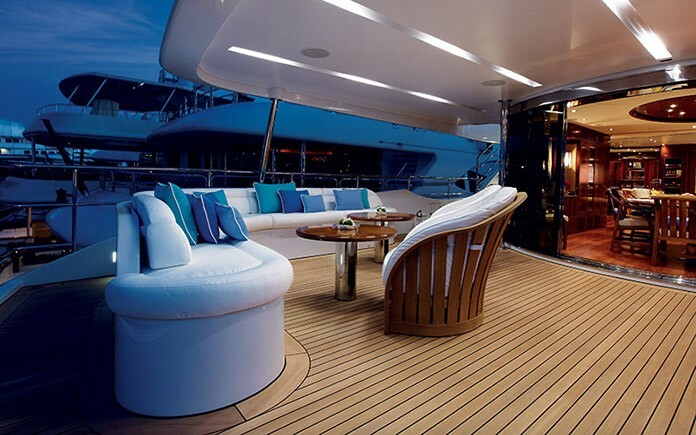 Four decks that are fully livable, with large areas for socialising that are protected with maximum privacy. Of the main innovations, the stern area offers a distinctive reorganisation: the customary garage for tender, jet skis, and other equipment has been moved forward toward the bow with an opening on the side, allowing the entire stern area to be dedicated to a beach area that is free of all mechanical equipment and is outfitted with a shower, bathroom, fridge, galley, armchairs. 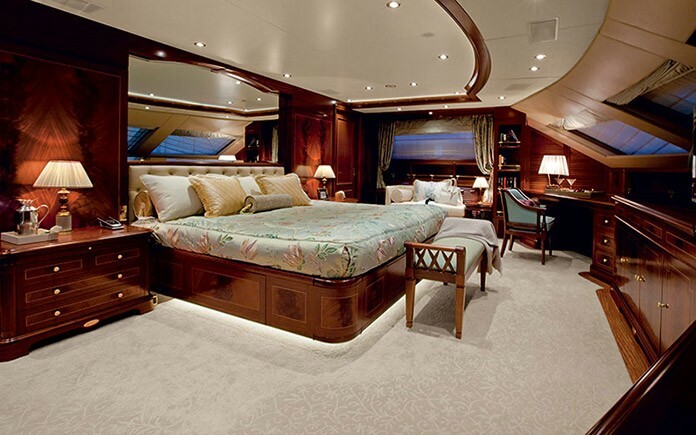 A repartitioning of the lower deck made it possible, thanks also to an extremely functional engine room that offers more space for guest cabins, four in all, two with double beds and two with twin beds, and for the crew area, featuring unheard-of volumes for the comfort of the staff on board. 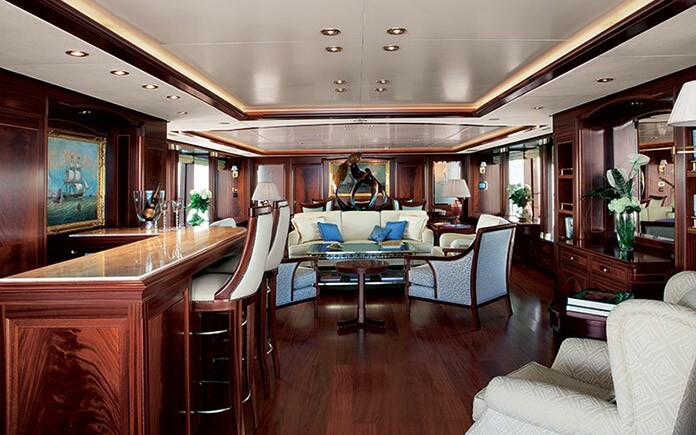 The main deck is the true beating heart of the boat: with a large living area with a central sofa and comfortable armchairs and a bar area, it is the ideal place for relaxing. 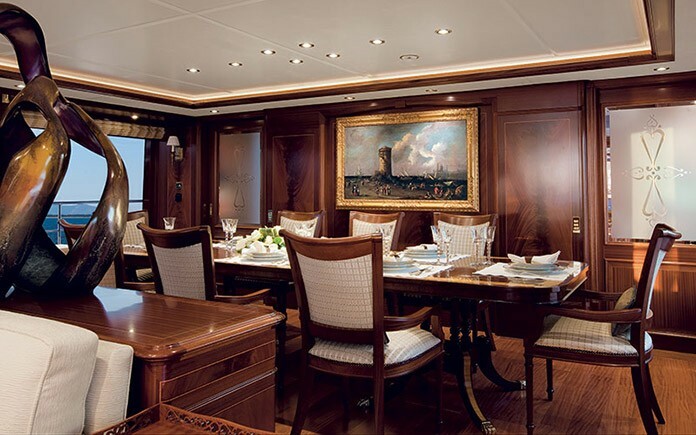 The main saloon is capped by the dining area, where you’ll find an elegant table with seating for eight in classic style. 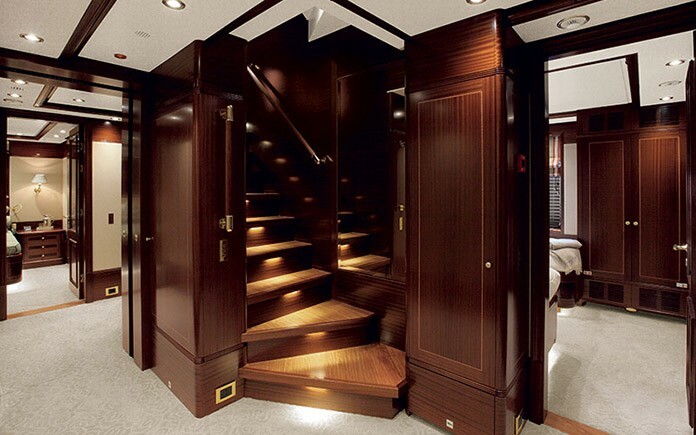 Amidships, the foyer with stairs leading to the other levels. 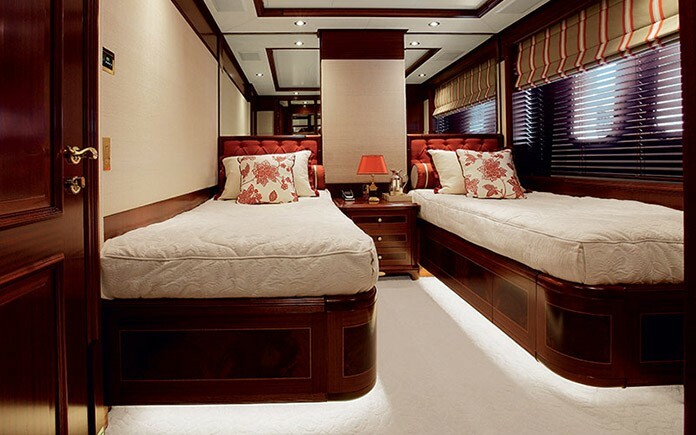 Continuing along toward the bow takes you to the owner’s cabin, set off by full-height windows that offer stunning views of the sea, whether underway or at anchor: the place where everyone wants to be. 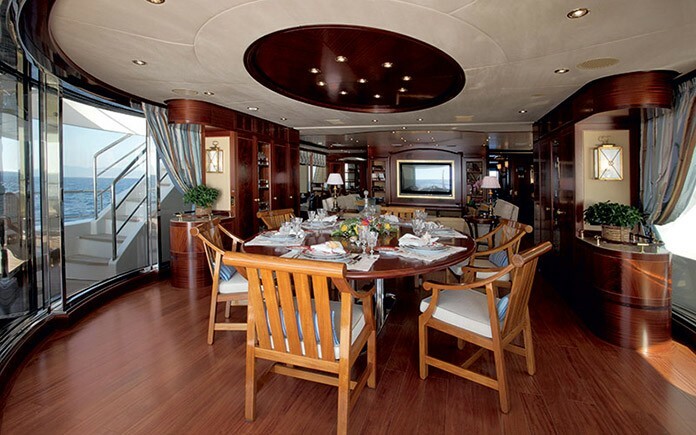 The upper deck is dedicated to the living area: at the stern, a dining table surrounded by openable glass doors that close to form a semicircle with a striking view of the horizon. Closing the glass doors it is possible isolate this zone from the exterior and provide climate control. 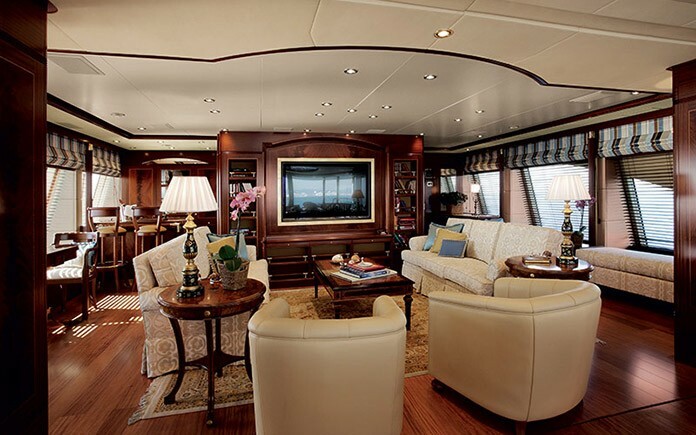 The bow contains a control room and the commander’s cabin, while outside we find a large area with open-air sofas. 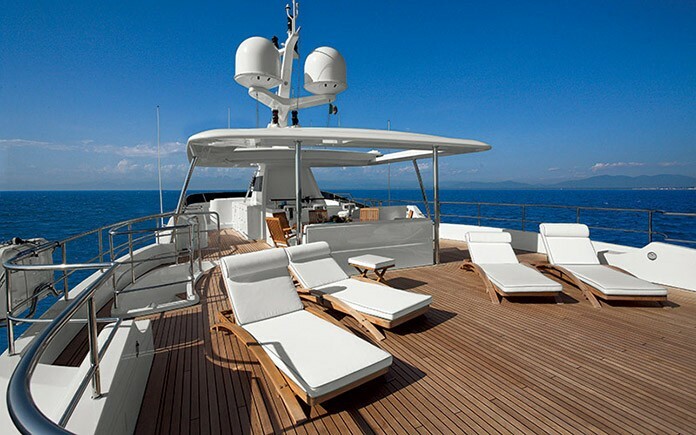 On the sun deck, we find a spacious surface for relaxing and sunbathing. You’ll also find a reference to days gone by, a reassuring symbol of sea and navigation: the smoke stack. In order to show that on this new and modern boat, everything still tastes of sea and salt. The smoke stack has a function different than the ones we used to know, being repurposed for hiding mechanicals and providing stowage space. 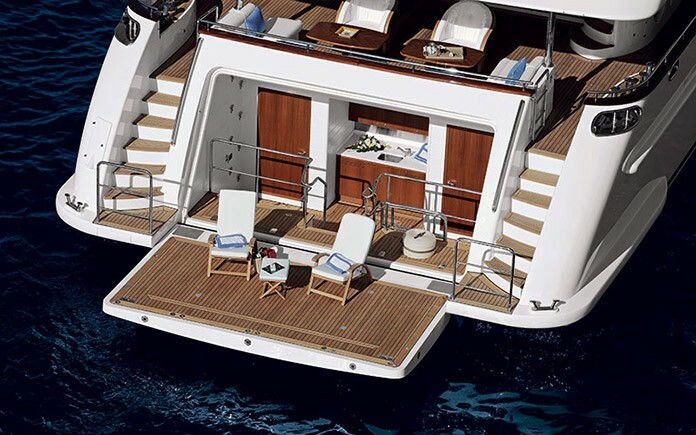 The hard top with sliding cover ensures adequate shelter from the sun while at the table or in the dining area, while at the same time enabling guests to continue enjoying the breeze and the sun in the relaxation area toward the stern. 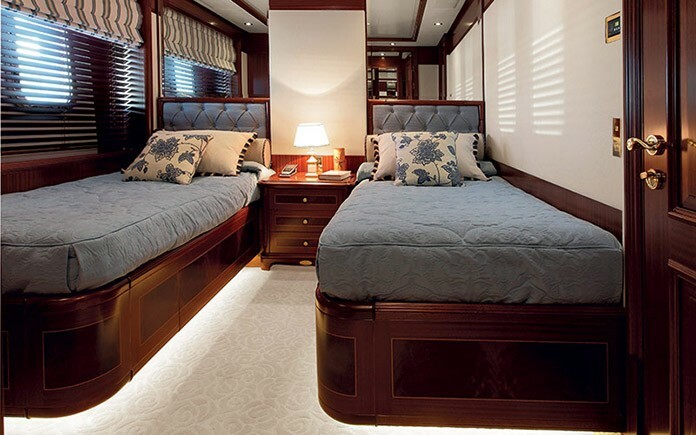 Interior styling is at the complete discretion of the boat owner, who can customise the environments according to his or her tastes and desires, and for this first yacht, strong Caribbean influences have been proposed, from finely treated mahogany for wood surfaces to gold-plated finishes. The Crystal measures 42 metres in length and 9 metres in width at full beam. Its displacement is 375 tonnes. The engines are twin Cat C32 Acer delivering 1081 kW. 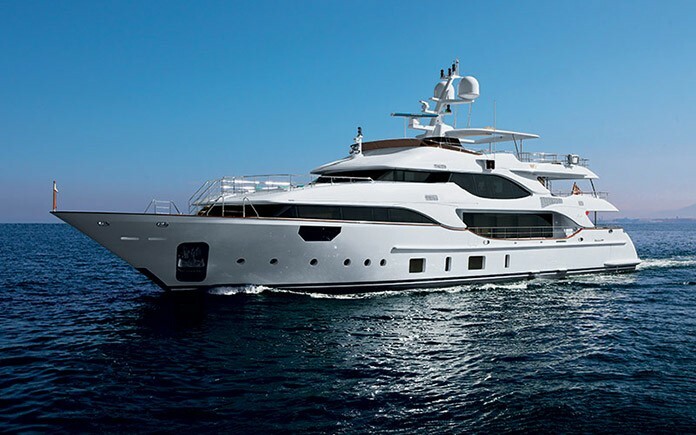 And with a fuel reserve of 58,000 litres, the Crystal has a conventional oceanic range of 4,000 miles, which places it among authentic “navetta” that are capable of travelling around the world and exploring locales where autonomy and spending long periods without refuelling becomes essential. Maximum speed at half load is 15 knots, with 14 knots possible at 85% power. Lateral stability is assured by a fairly broad hull and by the fins in the Naiad Stabilization Anchor system, which is also capable of functioning when the yacht is at anchor. 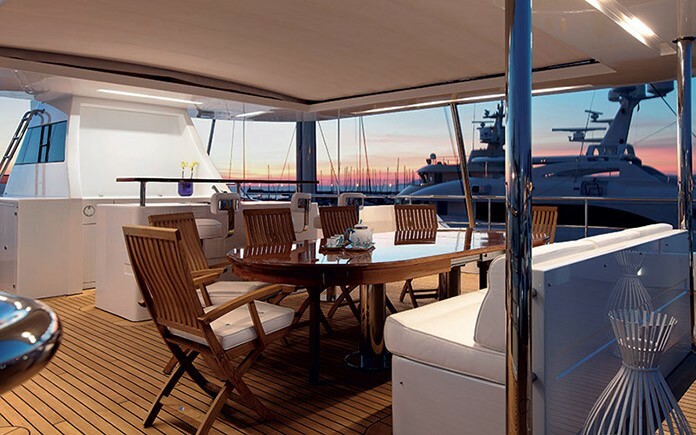 On-board systems are equipped with state-of-the-art Benetti technology, which allows centralised control, including remotely, of all on-board electrical and electronic equipment, as well as all boat systems, by monitoring operating status and reporting any anomalies. The touch-screen interfaces are extremely user friendly and intuitive. Particular attention was paid to the design of the wheelhouse based on innovative integrated architecture that, thanks to LCD monitors with latest generation of touch- screen functionality and ergonomic controllers, has made it possible to reinstate all functions in a single control panel, resulting in an efficient console with an avant-garde look and functionality. 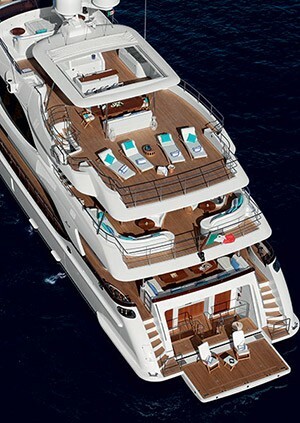 The beating heart of the entertainment system is the centralised system BEST – Benetti’s Exclusive Sea Technology – which manages the main operative features, ranging from video on demand to home automation, from satellite telecommunications to video monitoring, here as well by way of user interfaces based on touch-screen technology.